In the spirit of Halloween, eigoMANGA has released a DLC (downloadable content) for the game ‘Vanguard Princess‘ that features the demonic game character, Lilith. 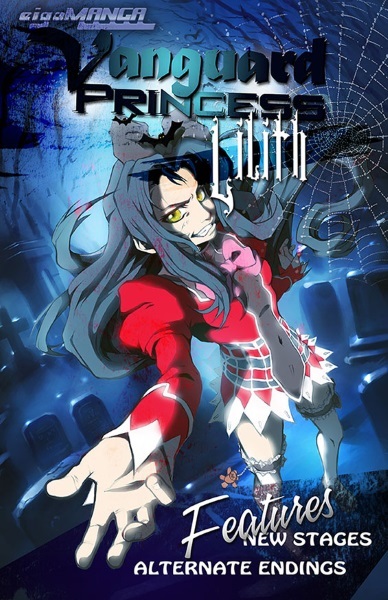 Lilith is a pre-teen brawler who claims to be “The Daughter Of The Devil”. The DLC known as ‘Vanguard Princess Lilith’ is available on the game platform Steam. ‘Vanguard Princess’ is a 2D fighting game for the PC that features an all-female cast each with their own unique fighting style. Players can choose from ten girls with unique fighting skills and pair them with a younger assistant partner. ‘Vanguard Princess Lilith’ stars the dark and mysterious character, Lilith. She made her way from The Netherworld to the world of mortals and used her demonic powers to gain control of The Girls’ Academy as the Headmistress. The DLC is an updated and uncensored version of ‘Vanguard Princess’ that features new Halloween-themed battle stages, additional in-game music, as well as alternate story-lines and endings. Also included is the ability to play with the game’s final boss character, Hilda Rize (another Halloween-themed character from The Netherworld). Hilda Rize can be played in the game’s Arcade Mode or Two Player Mode.